Forecasters are predicting this year to be one of the worst hurricane seasons for the Atlantic, putting Florida weddings at risk. 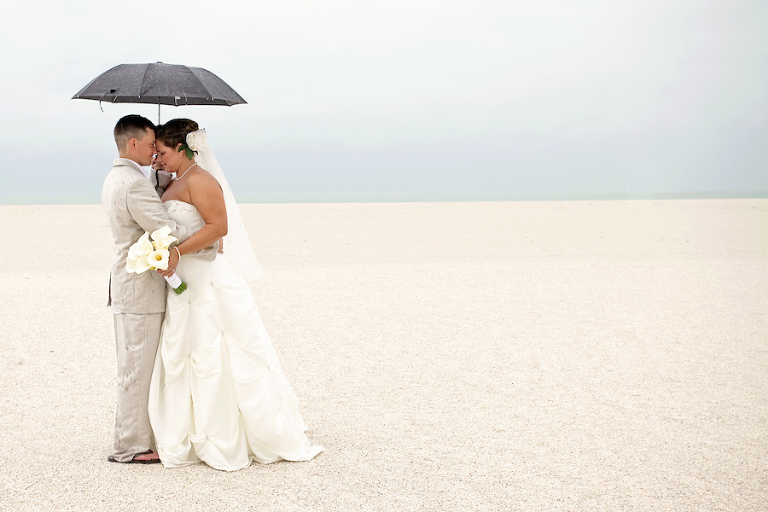 With flooding, damage and cancellations from Hurricane Irma still fresh in our minds, we wanted to learn more about how couples can protect their wedding investment, so we reached out the wedding insurance experts at Wedding Protector Plan. Hurricane season runs June 1st through November 30th, which means that weddings taking place almost half of the year are at risk. Just last week, the National Oceanic and Atmospheric Administration (NOAA) released that this year there is a 45% chance for an above-normal season, and that there is a 70% chance of having 10 to 16 named storms, of which five to nine could develop into hurricanes, including one to four major hurricanes (Categories 3-5). So what happens if a hurricane hits, causing your wedding venue to shut down or what if your parents can’t catch a flight to Florida to see you get married or what if your bridal shop is flooded before your wedding date and your dress gets ruined? There’s an insurance for that. What hurricane scenarios would be covered? Wedding Protector Plan: Cancellation or postponement of the wedding would be covered if a hurricane were on its way to ruin your special day. If your vendors or your venue didn’t refund your deposits due to the cancellation, our policy can help reimburse the lost money to you so you can begin planning another date. 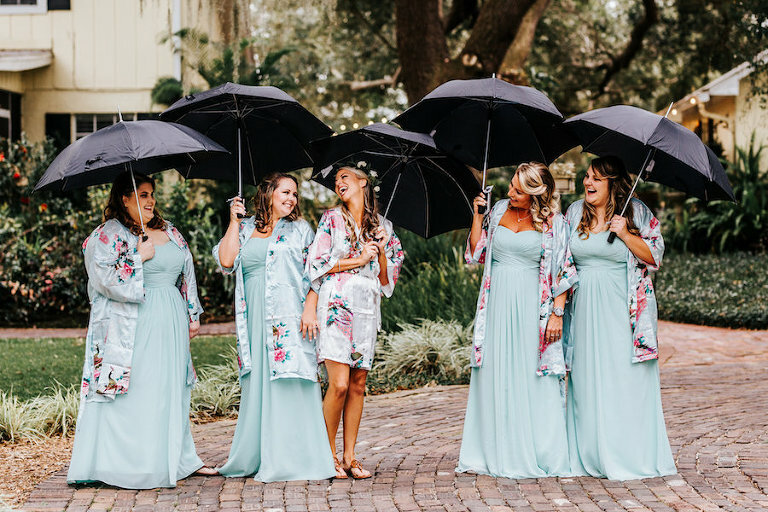 While in some cases it is very easy to determine that the hurricane will hit your city on your wedding date, you never know when a storm might make a last minute path change that could impact your day. I’m sure all of us in Tampa Bay remember when Hurricane Irma suddenly changed course and was heading straight for us instead of Florida’s east coast. Everyone scrambled to get last minute supplies and certain areas underwent mandatory evacuations. Weddings were suddenly cancelled as people begin driving to cities not in Irma’s paths. There is coverage if this happens to you, or if roads are suddenly closed due to the extreme weather, a state of emergency is declared, or if your venue can’t open due to the storm. If the bride, groom, or their immediate family is unable to make it to the wedding due to travel impediments caused by the hurricane, such as flight cancellations, coverage for cancellation or postponement is applicable. If the hurricane isn’t as severe as expected and you’re able to hold your wedding, but you find out that a vendor is closed due to the storm or can’t deliver the contracted services, like a bakery that can’t make your cake due to no power, you would have coverage for lost deposits if they chose not to refund you. Lastly, our policies can protect money lost if the hurricane strikes well before your wedding date but causes you financial loss. An example of this would be the extreme flooding Texas experienced after Hurricane Harvey. This flooding damaged homes and businesses alike, and bridal dress shops and alteration stores were left with damaged dresses when the flooding subsided. What mistakes do couples make when it comes to getting hurricane coverage? Wedding Protector Plan: In 2017, we had to turn away coverage for many people who were trying to buy a policy after they had found out that Hurricane Harvey, Irma, or Maria was heading their way. To have weather coverage, policies need to be issued several weeks in advance of the event date, at a very minimum, because we cannot cover catastrophic weather events once they become known about. Even if your wedding is not during hurricane season, it is possible your venue can become severely damaged or may not have power for weeks due to the storm; this can lead to cancellations for months to come while the venue undergoes repairs. Hurricanes Maria and Irma caused so much devastation in islands popular for destination weddings, and plenty of weddings were cancelled during and after hurricane season while the islands rebuilt their infrastructure. A wedding is an investment, and it is the start of a life-long journey; don’t wait until the last minute to protect your special day. Purchase wedding insurance as soon as you can so you can have peace of mind from the start of your wedding planning ‘til the wedding day itself. Wedding Protector Plan: Through the Wedding Protector Plan, cancellation/postponement insurance begins at $160, which will cover a wedding that costs up to $7,500. As the national average for weddings is closer to the $25,000-$35,000 range, policies that will adequately cover that amount will be $255 for $25,000 in coverage or $300 for $35,000. If your budget is significantly higher than this, we have very affordable coverage for weddings of all budgets. For example, if your wedding costs $175,000, a policy would only cost you $1,025. While the vast majority of our claims arise from money lost to vendors or the venue due to uncontrollable circumstances, we offer optional liability and liquor liability that can be added onto the policy. Some venues nowadays are even beginning to require that you carry liability coverage on the day of the wedding in case a guest has an accident or damages something on the property. If you needed this coverage, liability begins at only $165 for a $1,000,0000 General Aggregate, and you can add this coverage to your cancellation/postponement coverage policy through us. Wedding Protector Plan: Our policies protect the payments you’ve made to your venue and contracted vendors, such as your DJ, caterer, florist, photographer, bridal shop, etc. If these vendors happen to go out of business, not show up to the wedding, or don’t deliver the services you’ve paid for and outlined in your contract, our policy can help pay you back the deposits you’ve lost to them and can even help you pay for a replacement vendor. Unfortunately, issues with vendors happen to be our number one source of claims. One example that most of you have probably heard of is when Alfred Angelo, a bridal dress shop, closed numerous stores nationwide in 2017, leaving many dress orders unfulfilled. 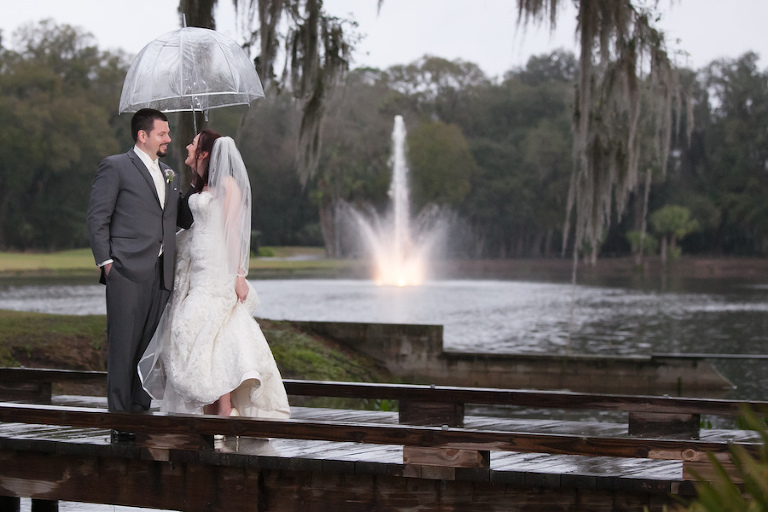 The cost of the wedding is also protected if you had to cancel or postpone the wedding due to catastrophic weather events, such as hurricanes or extreme flooding, sudden illness or death in the immediate family, or venue unavailability, such as your venue double-booking or getting damaged during a hurricane and closing for repairs. Our policies can cover the rehearsal, rehearsal dinner, ceremony, reception, and in most states, a post-wedding day brunch. If the wedding is cancelled or postponed, the honeymoon expenses can also be covered. The costs for all of these events should be factored in to the level of coverage you are purchasing. The optional liability and liquor liability coverage can protect the bride and groom if a guest has an injury on premises and sues the couple, or if someone breaks something at the venue and the wedding couple has to pay the venue for those damages. When do I need to purchase it? Wedding Protector Plan: We recommend purchasing a policy as soon as you begin putting deposits down for your wedding. Unfortunately, we have heard many stories about venues that continued booking weddings even though they were in the process of foreclosing or had begun the process of selling the venue to new owners that may not honor previous event bookings. We have also heard plenty of tales of couples who paid a vendor a deposit and then were never able to get back in contact with that business. Once you have already found out that you have experienced a financial loss, it is too late to have coverage for that circumstance if you have not purchased a policy. The insurance is designed to protect against unforeseen and uncontrollable losses that occur after you’ve purchased a policy. We can issue policies up to two years in advance of the wedding date, and we always recommend purchasing the policy sooner rather than later. If you are not sure whether you need liability coverage for your venue, but you’ve already put a deposit down, you can purchase the cancellation/postponement coverage so your deposits are protected for potential losses like a venue or vendor bankruptcy, and you can add liability and liquor liability coverage onto our policy up until a few days prior to the wedding. Underwritten by Travelers, the Wedding Protector Plan provides wedding insurance coverage for the ceremony, reception, rehearsal, rehearsal dinner, and possibly a post-wedding brunch, all for affordable rates with no deductible. With last year’s devastation from hurricanes, wildfires, earthquakes, and nor’easters fresh in everyone’s mind, and with venues increasingly requiring insurance, find out how wedding insurance can protect your special day. This post was sponsored by Wedding Protector Plan. © 2019 Marry Me Tampa Bay | Local, Real Wedding Inspiration & Vendor Recommendation & Reviews|ProPhoto Site|Design by Northfolk & Co.